ON THIS DATE (May 27, 1955) ... 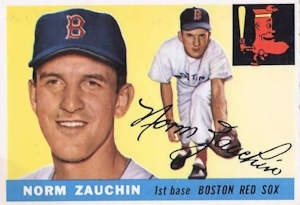 Norm Zauchin, the Red Sox first baseman whose bat had previously resembled a pop gun, suddenly found he was aiming a cannon tonight as he put on a tremendous batting display with three homers, a double and 10 runs-batted-in as the Red Sox leveled the Washington Nationals, 16 to 0. Zauchin’s performance before 15,775 was amazing, to say the least, since he included a two-run homer, a grand slam and a three-run home in the greatest individual display of batting since Rudy York toiled for the locals and drive in 11 runs in one game (1946). Zauchin fell one RBI short of the all-time American League record and two short of the all-time National League record established in ‘24 by Jim Bottomley. First inning: Hit a two-run homer off Bob Porterfield. Second inning: Hit a grand slam home run against reliever Dean Stone. Fourth inning: Doubled against the left field wall, knocking in one run against Ted Abernathy. Fifth inning: Hit a three-run homer over everything in left field against the same Abernathy. Zauchin was not retired until the seventh inning when Pablo Ramos struck him out. The 16 runs the Red Sox scored marked their highest of the season and signaled the end of a dismal, no-hit show that saw them lose six of their last seven games. They banged out 13 hits against a quartet of Washington pitchers and the fact that Brewer pitched shutout ball was lost in the shuffle of the excitement of the 25-year-old Zauchin’s slugging. When he came to bat in the seventh, Zauchin was shooting for several marks. He could have tied the all-time RBI mark for one game had he parked one with Jackie Jensen on base. Then, too, he would have tied the all-time homer mark for one game had he hit another one. But he was obviously over-anxious, and when Ramos did fan him he swing at what appeared to be a high, outside pitch. York and Tony Lazzeri (Yankees) each drove in 11 in an American League game.